Never before have scientists been able to make scores of simultaneous genetic edits to an organism's genome. But now, in a landmark study by George Church and his team at the Wyss Institute for Biologically Inspired Engineering at Harvard University and Harvard Medical School, the gene editing system known as CRISPR–Cas9 has been used to genetically engineer pig DNA in 62 locations—an explosive leap forward in CRISPR's capability when compared with its previous record maximum of just six simultaneous edits. The 62 edits were executed by the team to inactivate native retroviruses found in the pig genome that have so far inhibited pig organs from being suitable for transplant in human patients. With the retroviruses safely removed via genetic engineering, however, the door is now open on the possibility that humans could one day receive life-saving organ transplants from pigs. Church is the Robert Winthrop Professor of Genetics at Harvard Medical School and a Wyss core faculty member. The advance, reported by Church and his team, including the study's lead author, Luhan Yang, a research fellow at HMS and the Wyss, was published in the October 11 issue of Science. The concept of xenotransplantation, which is the transplant of an organ from one species to another, is nothing new. Researchers and clinicians have long hoped that one of the major challenges facing patients suffering from organ failure—the lack of available organs in the United States and worldwide—could be alleviated through the availability of suitable animal organs for transplant. Pigs in particular have been especially promising candidates due to their similar size and physiology to humans. In fact, pig heart valves are already commonly sterilized and decellularized for use in repairing or replacing human heart valves. But the transplant of whole, functional organs composed of living cells and tissue has presented a unique set of challenges for scientists. One of the primary problems has been the fact that most mammals, including pigs, contain repetitive, latent retrovirus fragments in their genomes, present in all their living cells, that are harmless to their native hosts but can cause disease in other species. "The presence of this type of virus found in pigs—known as porcine endogenous retroviruses, or PERVs—brought more than a billion dollars' worth of pharmaceutical industry investments in developing xenotransplant methods to a standstill by the early 2000s," said Church. "PERVs and the lack of ability to remove them from pig DNA was a real showstopper on what had been a promising stage set for xenotransplantation." 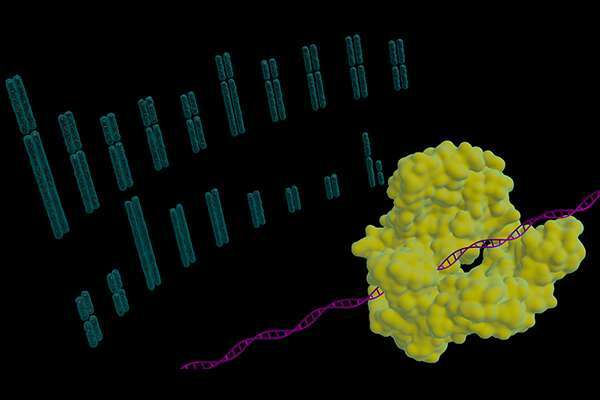 Now, using CRISPR–Cas9 like a pair of molecular scissors, Church and his team have inactivated all 62 repetitive genes containing a PERV in pig DNA, surpassing a significant obstacle on the path to bringing xenotransplantation to the clinic. With more than 120,000 patients currently in the United States awaiting transplants and fewer than 30,000 transplants on average occurring annually, xenotransplantation could give patients and clinicians an alternative in the future. "Pig kidneys can already function experimentally for months in baboons, but concern about the potential risks of PERVs has posed a problem for the field of xenotransplantation for many years," said David H. Sachs, director of the TBRC Laboratories at Massachusetts General Hospital, the Paul S. Russell Professor of Surgery Emeritus at HMS and professor of surgical sciences at Columbia University's Center for Translational Immunology. Sachs has been developing special pigs for xenotransplantation for more than 30 years and is currently collaborating with Church on further genetic modifications of his pigs. "If Church and his team are able to produce pigs from genetically engineered embryos lacking PERVs by the use of CRISPR-Cas9, they would eliminate an important potential safety concern facing this field." The remarkable and newly demonstrated capability for CRISPR to edit tens of repetitive genes such as PERVs will also unlock new ways for scientists to study and understand repetitive regions in the genome, where an estimated more than two-thirds of our own human genome resides.